Something magical happens when you roast things… the flavors blend, and morph, and change into something completely next level. 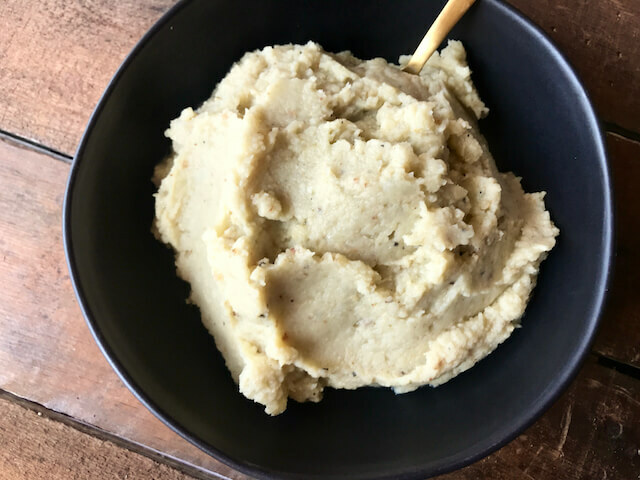 That’s why I swear to you, this recipe is the best and the tastiest Cauliflower Mash I’ve ever tried! When I have the chance, especially in colder months, I roast any and every vegetable before doing anything with it. This makes a world of difference, allowing all those tastes to just explode out of the ingredients. There are a lot of recipes out there for small variations on simple mashed cauliflower. So what I’ve done is taken an old standby recipe of mine and leveled it up so to speak. 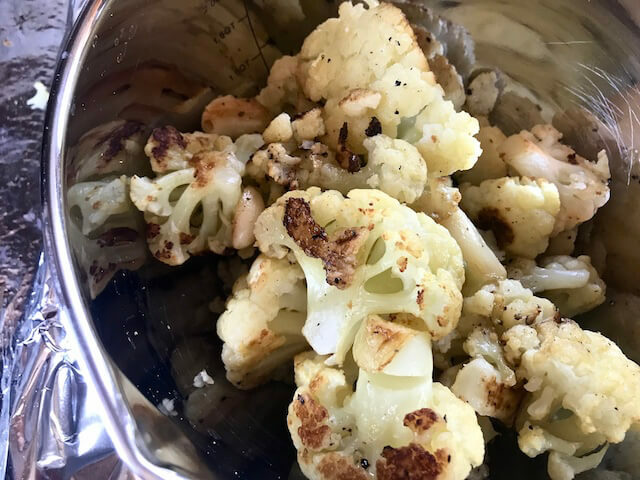 Instead of just boiling the cauliflower, adding some goodies, then mashing it all up, this time we’ll be roasting the garlic and the cauliflower before (I know that adding a step usually means adding dishes, but trust me – it’s totally worth it!). If your family is traveling to a Thanksgiving, Christmas, or other wintertime gathering, you’re probably doing about 5 things all at once: Keeping your kids and spouse herded together, making sure everyone is getting things packed and loaded in the vehicle, and all while keeping things on schedule. If you’re doin’ all that while also preparing & cooking a dish to pass, it can be both stressful and challenging. On the other hand – If you’re hosting a get-together (which means you’re probably doing the cooking) and groups of excited family and friends are drawing ever closer to your home, I don’t need to explain why this situation is also stressful and challenging. Y’all, let’s go ahead and throw overwhelming in there too. These potatoes are pretty dang easy, which makes them a great fit for either of these holiday celebration situations! Of course, they will work out great for any old night of the week. But since we’re talking holiday meal situations here… just throw these on the Thanksgiving and/or Christmas table alongside the smorgasbord of turkey, stuffing, gravy, green bean and corn casserole, pie, and everything else for a delicious and guilt-free addition. I’m not going to sit here and tell you they taste exactly like mashed potatoes, because nothing can ever replace mashed potatoes. But I’m gonna to tell ya – these are pretty dang delicious. With a scoop of these roasted beauties on my plate and a little gravy on top, I don’t really miss those regular ol’ potatoes. I was hangin’ out over on Instagram the other night and saw an Instagram story from my friend Cassidy, over at CassidyEats. [Fun fact: We met up about a month ago. We ate tacos, I drank sangria in the middle of the day, and now we’re best friends forever!] A few days ago she was talking about doing a KFC-type Famous bowl, with my recipe for Skillet Pickle Chicken. Since then, I’ve been dreamin’ about it once every hour of every single day. Skillet Pickle Chicken in KFC Bowl form… Let’s all take a moment to drool together now. 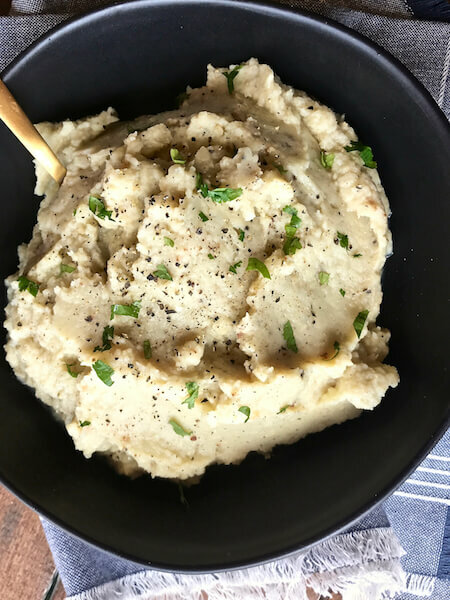 I had to test out this here recipe for Roasted Garlic Cauliflower Mash one more time. So last night I cooked this one up, along with some of my good ol’ Skillet Pickle Chicken, a lil corn, and some Heinz chicken gravy out of the jar. Because I like making stuff myself, but let’s face it- I’m not quite Martha Stewart over here, so sometimes a jar of gravy does the job. Oh, and don’t forget the cheese… Don’t ever forget the cheese. Anyway, this do-it-yourself “Famous Bowl” could be my new favorite thing in the world. I didn’t get a photo to post because it was dark o’clock when I got’m made, but I’ll be making this forever now because it tasted next level delicious. And well, this girl’s stomach and KFC chicken don’t always get along, so I’m gonna stick with these. Thanks for the dinner idea, Cassidy… You’re the real MVP! Now let’s get in the kitchen! Preheat the oven to 425 degrees, and place nine cups of smallish-chopped cauliflower florets in a large stock pot. Throw eight- I repeat eight– garlic cloves in there. 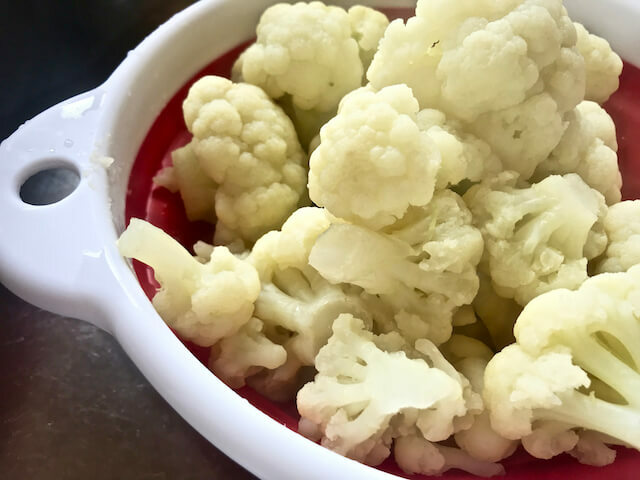 You can “cheat” and use a couple bags of fresh cauliflower florets that are already cut and washed from the produce section in your grocery store. This is what I normally do because I like shortcuts, and I have an aversion to cutting up cauliflower. Is that weird? I just can’t stand all the tiny baby pieces that explode everywhere… I always feel like I’m doing it wrong. Now add enough water to cover the cauliflower, and about a teaspoon of kosher salt. 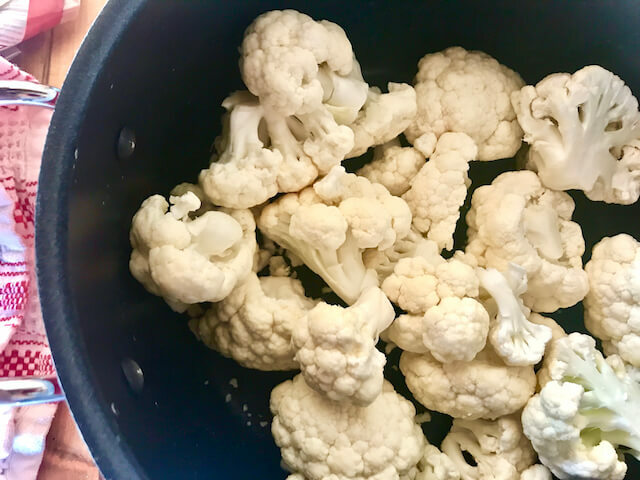 Bring the water to a boil and cook the cauliflower for about 5 minutes. It doesn’t need to be completely tender, just enough to soften it a bit. then drain the water off. Grab a sheet pan and spray well with cooking spray. I normally put foil down first just to make cleanup easier, but it isn’t necessary. 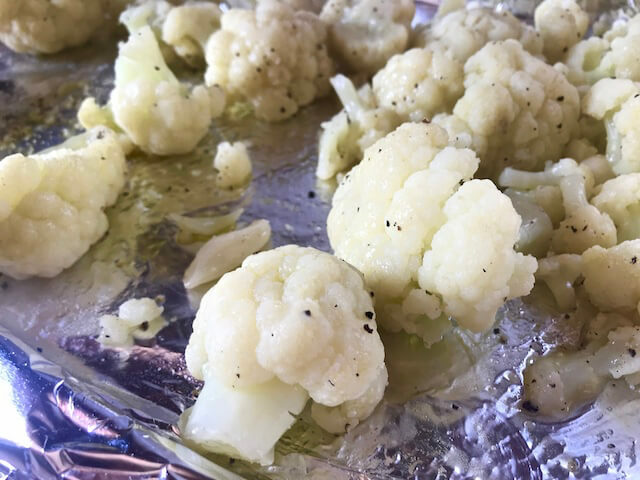 Spread out the cauliflower florets and garlic, then sprinkle with 1/4 tsp ground sage, 1/2 tsp onion powder, kosher salt, and pepper. Spray and coat the cauliflower well with the olive oil cooking spray. Roast the cauliflower at 425 degrees for about 20-25 minutes. 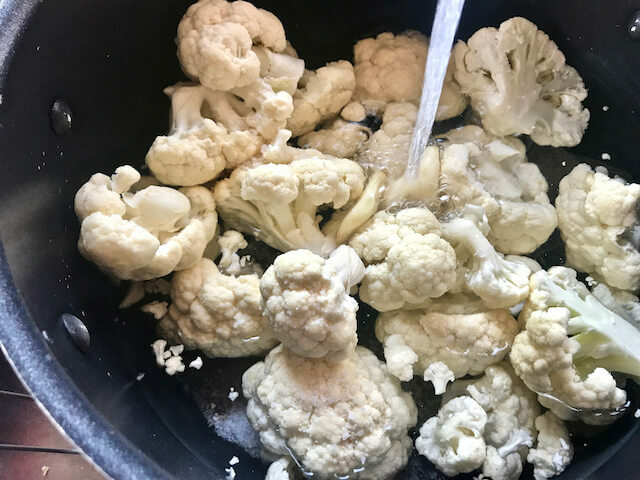 Throw the roasted cauliflower and garlic into a large bowl with 1/2 cup of chicken broth, 1/2 cup of nonfat Greek yogurt, and 1/2 cup of Parmesan cheese. You can use an immersion blender, a potato masher, or a food processor for this part, but I find the immersion blender creates the fluffiest “potatoes”. The masher just doesn’t get me to that fluffy place that I need to be, but you can totally use it. And the food processor is just too many extra dishes for me to deal with. Blend it all together until they are fluffy. You may need to add a little extra chicken broth, but I find it usually isn’t necessary. The most important part here is that you get them right to the perfect consistency that you love! Now just salt and Pepper to taste! And there we are! 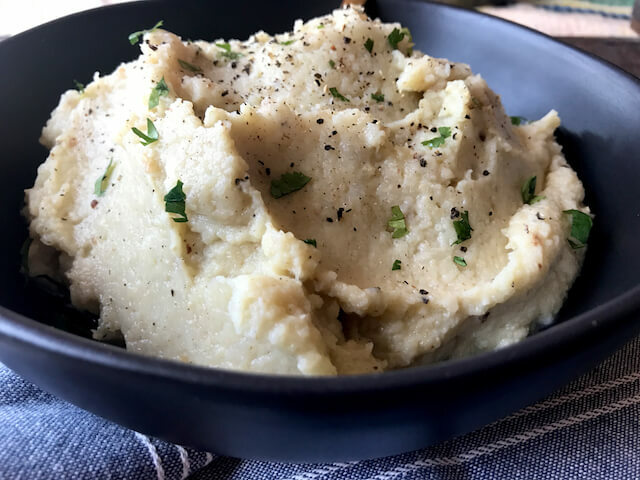 Healthier Mashed Potatoes, also known as Roasted Garlic Cauliflower Mash. It’s fluffy… It’s flavorful… and It goes with just about anything and everything. Some days, I might even prefer it over mashed potatoes, but I will always need both in my life. These are perfect for that low carb lifestyle! Ah, fake mashed potato perfection. Y’all stay tuned, because I’m gonna be postin’ a recipe for those Famous Bowls pretty darn soon! Make’m soon, and let me know how it goes! Fresh Cauliflower florets and garlic cloves roasted to perfection and mashed with chicken broth, parmesan cheese, butter, and greek yogurt. The perfect healthy side dish! Preheat oven to 425. In a large pot, add cauliflower and garlic cloves. Cover with water and salt the water. Bring to boil and cook for about 5-8 minutes. Drain the cauliflower and garlic. Spray a large sheet pan with olive oil cooking spray. Place cauliflower and garlic cloves onto the pan. Sprinkle with salt, pepper, onion powder, and ground sage. Spray well again with olive oil cooking spray. 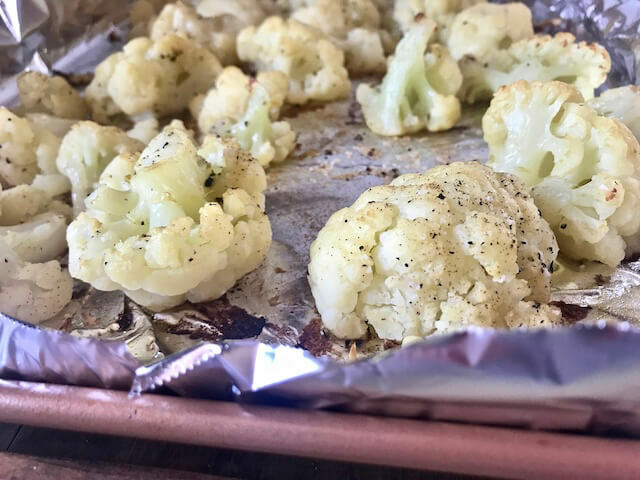 Place into oven for about 20-22 minutes or until the cauliflower is just a little browned and toasty. Add cauliflower and cloves into a large bowl. Add chicken broth, greek yogurt, parmesan cheese, and butter. With an immersion blender or potato masher blend until desired consistency. Salt and pepper to taste. Serve hot! Serves 8. Serving size: 1/2 cup. I just made this and by mistake left out the milk and butter. It is delicious!!!! I used Bel Gioioso freshly shaved salad blend (Asiago, Romano & Parmesan). Thanks for the recipe! I’m so happy you enjoyed Patty!! and so glad to hear it will still a hit without the butter & milk! I love that salad blend for cheese too. It’s addicting! Do you use freshly grated Parmesan or the cheese in the can? freshly grated is best or they have shredded in the refrigerated cheese section that works well too! I loved your recipe. I used 1 large fresh cauliflower. 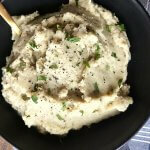 I had been putting off trying a version of this mash, afraid I wouldn’t like it although I love cauliflower. 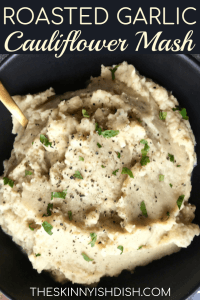 It was worth the extra steps and definitely a wonderful healthy substitute for mashed potatoes without the guilt. In the interest of trying to cook a nutritious Thanksgiving dinner (is that an oxymoron?) we’re planning on making cauliflower mashed potatoes. In an attempt to “fool” the kids, do you think i should add some potatoes to this recipe to make them more potato-like? Thx for the recipe, looks great! Hi Missy! 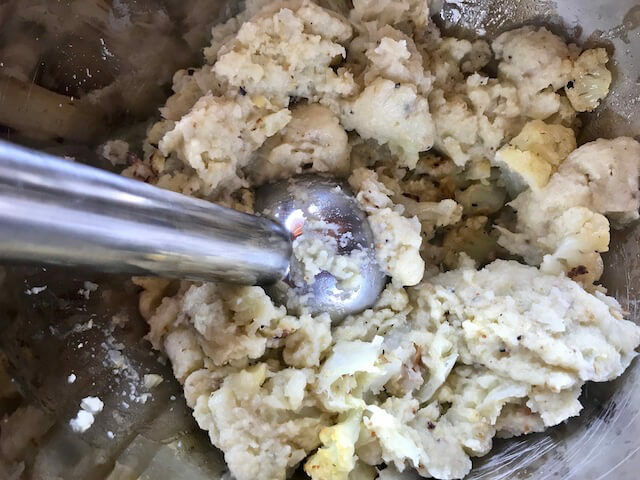 I have a recipe called “cauli-tater mash” that has a mixture of both and the smoothness of the potatoes does add a lot to the texture (and fooling unsuspecting kids!) I think that would work just fine and would keep the kids happy! i hope you love it. Let me know how it goes!